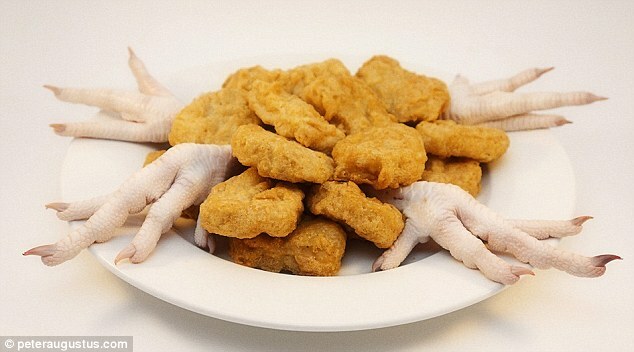 Indeed, most of us try and push the image of trotter or carcass to the back of our minds when eating processed food. Now, one photographer has laid bare the grisly reality of where our favourite foods come from – and it’s probably enough to deter you at least temporarily, if not for life. 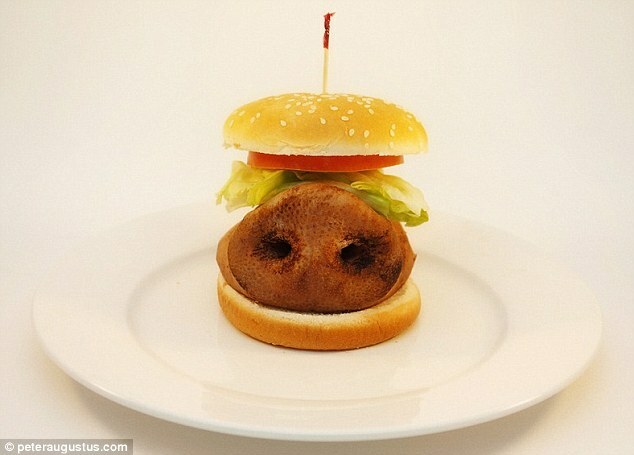 Taken by Texan-born Peter Augustus, they show popular dishes alongside the real, raw part of the animal they come from. is an unappetising-looking piece of intestine. 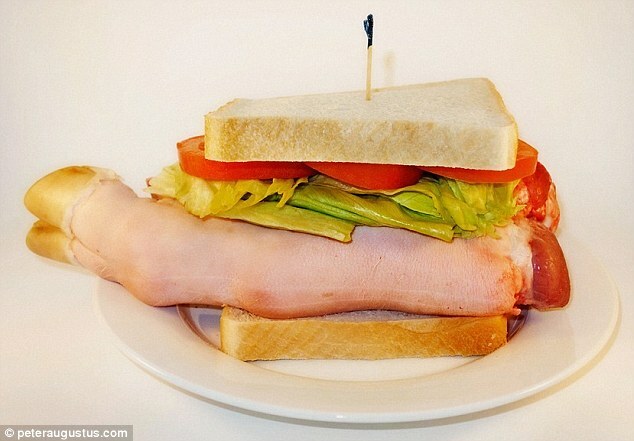 Mr Augustus says the project – inspired by his move to Hong Kong – ‘is not meant to be repulsive, but to raise awareness’ of where popular dishes actually come from. He said: ‘Arriving in Hong Kong for the first time, a city overloaded with visual stimulation, one of the most impactful scenes for me was the meat shops found in my neighbourhood of Sai Ying Pun. ‘As a foreigner from a major city in the West, most of us seldom see anything that even closely represents what kind of animal we are eating when we purchase it – it is always pre-packaged, nice and neat, showcased in an air-conditioned supermarket. Mr Augustus – who is not vegetarian – says his work, ‘a personal therapeutic process’, explores the relationship that most Western societies have with the meat that they eat. 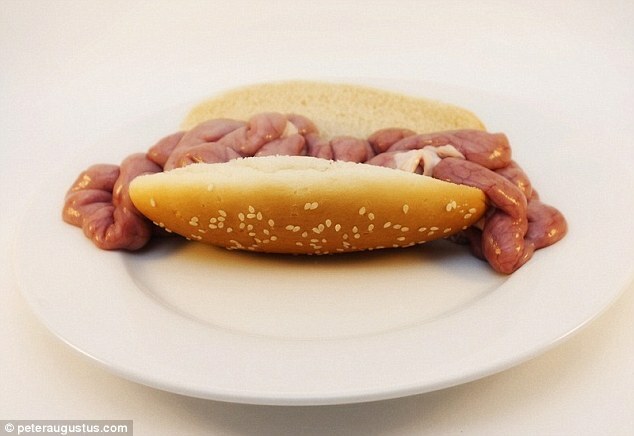 He added: ‘Shot using a white background with lighting meant to evoke an American diner or cafeteria, I take out the clean cuts and replace them with a real representation of the animal the meat comes from. The project itself was a labour of love – an involved traipsing around until he found a friendly bucher who could speak sufficient English. , as she could tell I was a little bit uncomfortable being surrounded all the raw meat,’ he recalls. In fact, her main focus was food handling and preparation. ‘She didn’t understand why a white person wanted all of these things to photograph and was very concerned if I knew how to handle it properly. However he admits the project has changed his eating habits. ‘I now make an effort to know where and how the animal I am eating was raised – and the results do dictate if I end up eating it.